Welcome to the 7 Day Scene Intensive Pre-Course. I’ve prepared some great content for you to take in before you submit scenes by midnight Pacific time on May 26. We don’t want you to miss any information related to the Intensive, so please take a moment to whitelist hello@writership.com by adding it to your contacts. To submit your scenes for the Intensive, all you need to do is click here, answer a few questions about your submission, and upload your scene. We'll include this link in every email, so it will be handy when you need it. Our intention with the pre-course materials is to help you become familiar with the structure and components of scenes in advance. We want to provide a foundation that you can absorb at your own pace so you can make the most of our time during the Intensive. The information has been divided into manageable installments because it’s a lot to take in and we know you have other demands on your time. We recommend marking time in your calendar so this important step isn’t neglected. Intensive Materials include information and explanations to help you understand what goes into a scene that works. Supplemental Materials include articles from the Story Grid site and other sources for additional support. Live Scenes are movie clips and screenplay excerpts to help you identify the Five Commandments and other components of scenes. Housekeeping information so you’ll know what to expect every step of the way, including the schedule for submissions and calls and instructions for uploading your scenes. Question or Prompt to help you think about the work in different ways. For our first installment, we'll begin with some basics. Intensive Materials: What is a scene? You can see how these components create a mini-story with loads of possibilities. In our next email, we'll look at Inciting Incidents, the event that kicks off a story or scene. 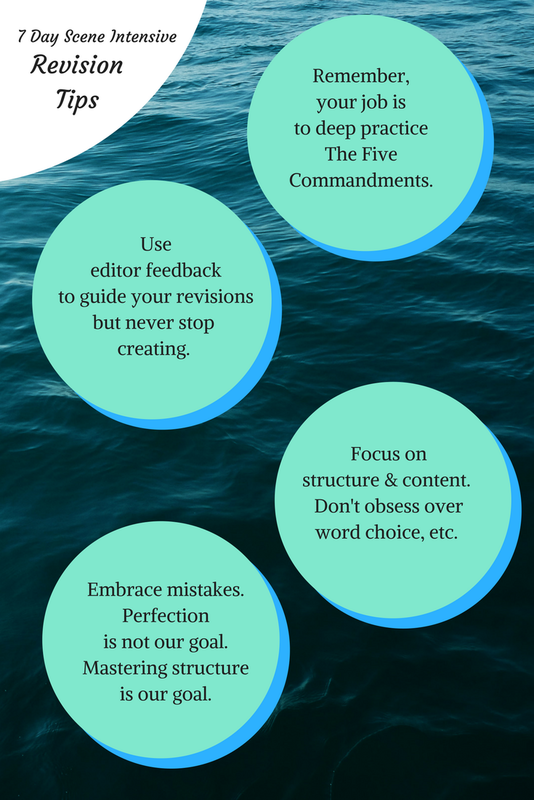 Take a few minutes to read this article from the Story Grid site that introduces you to the Five Commandments of Storytelling. We’ll be using a favorite movie of mine during our pre-course studies: the 2003 film Master and Commander (screenplay by Peter Weir and John Collee). Watch the trailer here to get a feel for the story and pay attention to the emotions evoked as you watch. You've already found our home base for the 7 Day Scene Intensive, and if you haven't already, take a moment now to bookmark the page. I'll post important notices here, as well as information and resources from the Pre-Course materials. If you need anything or have questions related to the 7 Day Scene Intensive, you can reach me at hello@writership.com. It’s so useful to be clear about our intentions when we embark on a new journey. Take a few minutes to consider and record what you hope to gain from our time together. If you’d like, hit reply and share your intention. If you have questions at any time during the Intensive, simply reply to one of these emails, and we’ll get back to you as soon as we can. p.s. Remember to whitelist hello@writership.com by adding it to your contacts, so you don’t miss a thing!